Breakthrough your limiting beliefs, unleash your power and share your healing gifts with the world! Shamanic Healing Arts Academy® · An Evolutionary Shamanic Healing Arts Academy to Empower Women to Thrive! A highly customized 1x1 integrative online coaching and personal healing program that combines the ancient wisdom teachings of yoga, shamanism, reiki, and empowerment coaching for a full body-mind-spirit transformation. I work with Yoga Teachers, Mind-Body Healers, and Spiritually-Based Entrepreneurs to Actualize their Visions! Can you relate to the following? Your current job is not working for you and you want a career change, yet you get paralyzed with fear, worry, or doubt around money and stability. You desire to be on a path of service, yet you don’t know how to do this full-time because you believe you lack the certifications, you don’t trust your abilities, or you just don’t know how. You want to breakthrough old patterns, beliefs and behaviors that are keeping you in the past and preventing you from living confidently in your life’s purpose. You have many creative, entrepreneurial visions, yet you find yourself disorganized, overextending yourself, procrastinating, overwhelmed and nothing gets done. You have not been fully living your truth or purpose, as you may suppress your feelings, feel resentful, sabotage yourself, or people please until you have nothing left. You are experiencing a life shift (i.e. divorce, career, relationship), and you have trouble trusting yourself, your intuition and the unknown. You know intellectually that the Universe supports you, yet you may feel alone, unsafe, and unaccepted in the world. You are seeking a spiritual community that understands you. You need that last piece of spiritual connection that finally shifts you out of guilt, shame or grief into forgiveness. I came to Nicole at a time when I was spinning my wheels. I'd made some big changes in my life which unexpectedly brought on anxiety and confusion, rather than the predicted increase in day-to-day happiness. Working with Nicole, we teased out what truly fulfills me and brings me joy and peace. The weekly exercises are life-long tools that I will treasure. Nicole helped me to come up with an attainable plan to get me out of my current situation and doing what I love. All in all, I'm blown away by how much Nicole was able to help me.She taught me how to better serve myself and my dreams for the future. Nicole is gifted not only in her ability to heal and nurture, but to make things happen. Nicole has masterfully been helping me to reclaim my power, guide me back to my true vision for my life, provide me practices and inquiries to get grounded and aligned with my truth, unlock strength and insight that felt dormant, navigate with me a new sense of self that's true and given me permission to trust myself and my intuition. This past year has been the most tumultuous year of my life…Nicole has helped me to find my power and celebrate who I am versus running away or jumping out. Nicole your guidance and wisdom are incredible. You are ready for emotional healing and deprogramming! All of these challenges you face above are awesome and exciting for me. It shows me that you are on the precipice of a true awakening of consciousness and ready to heal, reclaim your power and create the life you have imagined for yourself. I work with committed women who are ready for deep emotional healing work. Sometimes you may not think you are ready. When will be the right time? How will you get out of staying stuck in the past, playing small, not loving yourself fully, or not getting clear on your purpose or visions? You are the creator of your unique experience. You are the only one stopping yourself. It’s your “response – ability” that heals your triggers, emotional wounds, and traumas and stops the subconscious programs in their tracks. 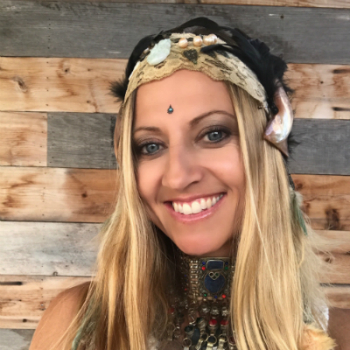 "Unleash the Priestess Within + Thrive" is an integrative online coaching and personal healing course that combines the ancient wisdom teachings of yoga, shamanism, reiki, and empowerment coaching for a full body-mind-spirit transformation. You are shifting careers and feel ready to move past your limiting beliefs and programs to step powerfully into service as spiritual entrepreneur. You are a yoga teacher, mind-body healer, therapist, or spiritual teacher and you feel committed to creating a business with income that supports you. As an awakened woman on a healing path, you want to breakthrough patterns that are keeping you in the past and step forward confidently into your life’s purpose. You want love yourself, be in your power, align with your purpose, speak your truth and have actionable steps and goals to create your visions! Create breakthroughs around your core wound stories and shift your perception of the past so you can emotionally heal and move through your daily life with more conscious awareness. Reclaim your feminine power and create inspired, tangible, real-time actions that will serve you, your community, family and friends. Learn to put yourself first, be accountable and practice radical self-love. This will give you the energy and momentum to serve from a more conscious place. Free your authentic voice so you can express your needs, and desires and boundaries in a healthy way that supports your energy and income. Clarify your visions and set goals to become a prosperous full-time healer now - if that's what you desire. 10 Live Calls with Your Coach, Nicole Doherty. 2 In Person or Remote "Shamanic Healing Sessions" Depending on your Location. Personal 1 x1 Email + Text Support Available. Lifetime Access to a Fully Customized Shamanic Healing Toolkit. Exclusive Access to My Private Facebook Group. Bonus One Month Follow Up Check In Support. Hi, my name is Nicole. I’m here to share my proven methodology to empower you to close the gap on your subconscious programming, unleash your priestess power and actualize your visions. For over 10 years I’ve been studying, teaching and mentoring with highly respected teachers, shamans and healers in the US and Peru. I’ve worked with thousands of students and clients over this time in their healing process. As a survivor of abuse and sexual trauma, I’ve come to understand through my own deep healing journey that we all have very specific core wounds programs in our subconscious mind that we need to work through with attention, accountability, compassion, sincerity, and love. I also understand what it’s like to be under the programming grip of what society and my parents wanted from me and having to undergo a process of deep inquiry, trust and leaps of faith to jump from 15 years of jobs in Corporate America to becoming a full time spiritually-based entrepreneur and business owner for a decade now. I’ve become highly adept sensitive and intuitive through this journey and thus very skilled at customizing programs with incredibly transformational results. Your journey begins with a deep alchemical healing process to discover your subconscious programming or core beliefs. These programs affect all levels of your development through the architecture of the chakra energy system. Each week we examine a new chakra through this programming lens to create and understanding of our beliefs and how that’s affecting our body-mind-spiritual balance. Let's create your life vision with tangible, actionable steps so you can thrive.This is a holistic and integrated approach to coaching and healing. These spiritual teachings are grounded in processes that create real tangible results. If you would like to know my credentials, I am a 500 E-RYT YogaWorks Teacher Trainer, Master Reiki Teacher + Trainer, Coach Training Alliance Facilitator, The Breath Center’s Breathwork Facilitator, and a Shamanic Reiki Practitioner. I teach classes, workshops and trainings on the West Coast and leading retreats around the world. I am a co-facilitator at the The Sacred Valley Spiritual Retreat in Mount Shasta, one of the premiere centers that leads healing retreats in the US and Peru. In addition to this program online, in-person I share Goddess Full & New Moon Gatherings, Cacao Ceremonies, Transformational Breathwork, Shamanic Reiki Circles and Women’s Empowerment workshops at large festivals like Lightning in a Bottle, Symbiosis, and Oregon Eclipse and Genius Loci. I write for a variety of wellness blogs, such as MindBodyGreen, Elephant Journal, Yoganonymous, Yogaworks, Beach Bodies, and American Athlete. I’m thrilled to be offering this program to you! A 12 week 1-on-1 highly customized personal Shamanic journey to empower and close the gap on your subconscious programming, while unleasing your priestess power to actualize your visions!